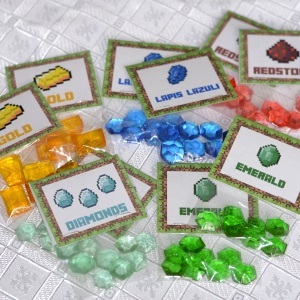 Candy Gems make perfect party favors for all themes but especially for Minecraft themed parties. 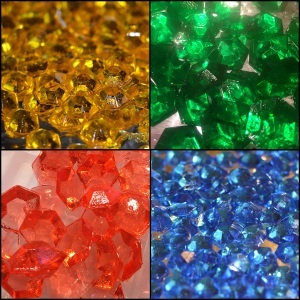 Here is the recipe we used and tips for making your own colorful candy gems. This recipe is simple but must be followed closely for best results. Take time to read through our tips! We have also listed the items we used at the bottom of the page, we purchased them from Amazon which had the best selection and prices after comparing with our local craft stores. For future reference, print our Candy Gem Recipe. Test your thermometer for accuracy by boiling water (212 degrees F). If your thermometer is a few degrees higher or lower, simply adjust for the difference when you reach the 300 degree mark. We used a digital thermometer and made it much easier since an alarm goes off at the desired temperature. We tested this at boiling point as well. Prepare everything before you start because timing is essential for success. Lay out a large piece of foil to work on. Spray your candy molds lightly but thoroughly and line them up on the piece of foil. Place foil next on either side of your stove. Place your large glass Pyrex measuring cup to the right along with your food colors and flavorings. On your right lay out your spoon and base of your digital thermometer if using one. 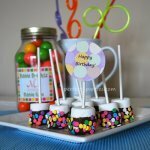 If not attach your candy thermometer to the pot at the height where it will be touching the candy syrup at all times. Mix all ingredients in your pot except the coloring and flavoring oil. Turn your stove on high and do not leave unattended. Do not constantly stir, the first time we did that, it caused the syrup to rise almost to the top of the 5 quart pot. When the mixture first starts to boil, the temperature will rise quickly to 212 degrees and rise slowly after. Noting that stove temperatures varies, ours hit 225 degrees after 5 minutes and about 275 at 12 minutes. When it reaches approximately 275, we added our coloring. 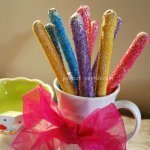 With gels I used a long skewer and dipped it in the candy syrup carefully. Do not exceed 300 degrees. We set the timer for 295 degrees. Turn the heat off and carefully pour the syrup into the Pyrex glass. Carefully pour the syrup into the molds. It will pour very thin and fast the first few minutes and noticeably thicker and slower the second mold. Fill until full but try not to overfill. By the third mold, the syrup was thick and hard to control. We poured it onto foil once it became too thick to control. Reheating in the microwave did not give good results although you may be able to save more of the syrup. We also did not try making a smaller batch. The candies will have a slippery feel, this will help keep them from sticking to each other. You can lightly dust it with powdered sugar to remove this but it will also make it more opaque. If you are making a second batch, you do not need to respray the molds with cooking spray. Do not exceed 300 degrees. Do NOT try to break or scrape off solidified candy in pot, on spoons or in Pyrex. It is sharp like glass, let is dissolve in hot soapy water. 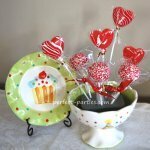 Do not use plastic lollipop molds, it can melt the mold. This is not difficult but takes time and patience. The most difficult part was holding the heavy 4 cup Pyrex and pouring a thin steady stream of syrup into the molds. The molds that were easiest to fill were the "break apart" molds with each cavity right next to each other however, if you overfill you will have to try to break the pieces apart which often lead to shattering or uneven edges. Perfect for a Minecraft themed party. We found small food grade bags and printed labels.